After Friday’s storms, Saturday broke with blue skies and – typically – not a lot of wind. But the buzz of the owners’ dinner at the Yacht Club Costa Smeralda the night before was still drawing smiles on the faces of the crews of the 15 Perinis taking part. And there was no stopping the yachts as they headed out onto the emerald waters of the Costa Smeralda. The breeze may have been light, but it was stable and the fleet was able to get racing. As with the first day’s race, competition was close on the water and the final scoreline perhaps didn’t reflect just how tight it had all been. The 50m Silencio, whose owner had only taken up the sport six months ago, came home with a second bullet to secure overall victory with a perfect scoreline – no doubt helped in part by the sagacity of guest tactician Dawn Riley. Demonstrating the diverse nature of the Perini fleet, second overall went to the 38m performance sloop P2, while the 53m *Parsifal IV *claimed the third spot on the podium. At the evening’s prizegiving, it wasn’t just performance on the water that was rewarded. Maltese Falcon was awarded the Pommery Award for Fair Play after going out of her way to make room at a mark on Day One of racing. 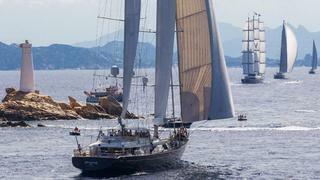 And the most important prize – that of best cocktail – was won jointly by the yachts Heritage, Helios and Panthalassa. It will be another two years before the Perini Navi Cup returns, but the extraordinary family feeling that surrounds the event, and the friendships made and renewed, will linger long in the memory.